Power BI and SQL Server 2012 (and beyond) both have components Microsoft developed to shift the focus of Business Intelligence onto business users. Since there are more people who use Excel than have eaten at McDonald’s, you may know about Power BI and the data features in Excel, but have you heard of Data Quality Services [DQS]? If not, well now you have. To get started, if you don’t have Microsoft’s developer version of SQL Server 2012 or later, or access to an enterprise or BI server somewhere, you will need $59.95 to get a copy of the Developer Edition SQL Server 2014. Interestingly Microsoft won’t let you buy the Developer Edition SQL Server 2012, which I found out when tried earlier in the year. Unfortunately, although Visual Studio is now free, you still have to pay for the Developer Edition of SQL Server. After you have installed SQL Server and selected that you wanted Data Quality Services, one would assume you had installed it. While that sounds like sterling logic, it is not correct. Here’s how to tell if you have DQS. Open up SSMS on your computer and look at the list of databases like I did here. Do you see any databases here which start with DQS? No. That is because it hasn’t been installed yet. It sure looks like it is if you look at the sql installer, which I have included below. I added the red boxes to highlight the fact that I really did select Data Quality Services when I installed. If you don’t have the Data Quality Services and Data Quality Client installed in SQL Server like they are here, you will need to do that first, but this is only the first step. 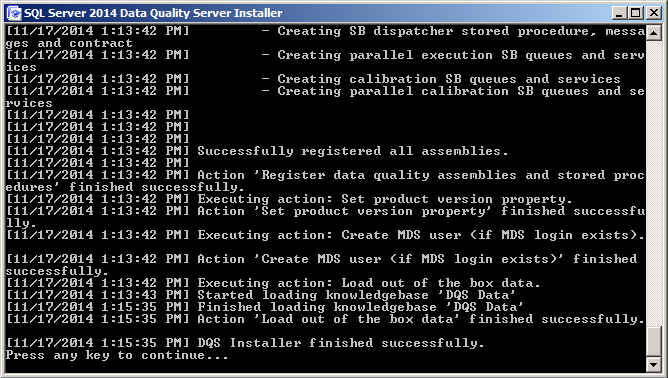 Once the install screen looks like the one pictured above, you need to go to the Data Quality Services folder in SQL Server and select the SQL Server Data Quality Server Installer. After this package is run, which takes a while, you will finally get a screen that lets you know the installation is finally completed. After DQS Server has installed, you will see that 3 databases have been added: DQS_Main, DQS_Projects and DQS_Staging_Data. 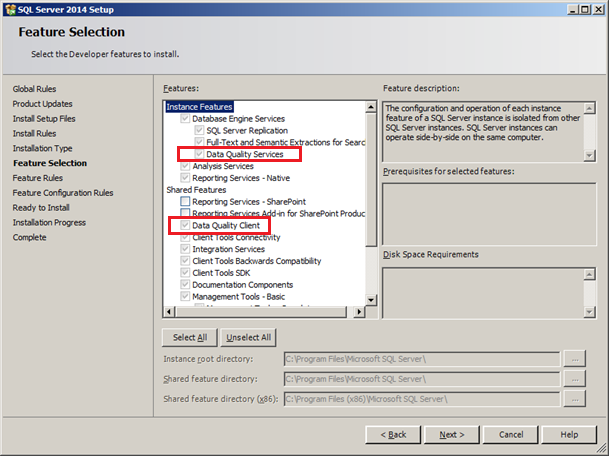 Once these three databases are installed, you can then start using the DQS Client. The DQS client does not need to be installed on a server. Since I highly doubt most places will want their business users to be directly accessing their Server, most of the time it will not be installed on the server. Once your environment is set up, it’s time to start using it. For more information on how to use DQS, please listen to my presentation on the PASS BI virtual chapter on November26. If you can’t make it, generally speaking it will be available on PASS BI’s You Tube Channel after about a week. I sincerely hope you can make it. Let me know what you think of my presentation by posting feeback to my blog.